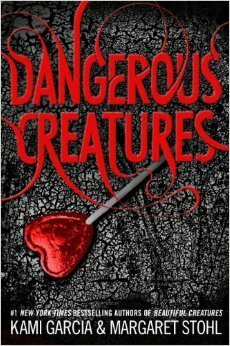 Some loves are cursed...others are dangerous. Okay I loved the Caster Chronicles. I loved Ethan and Lena and their struggle for pure love. But my favourite part of that series was Ridley Duchannes. So I was extremely excited for this spin off because we got to focus on Ridley. However, it was disappointing. I just don't understand the disconnect between the Ridley we met in the Caster Chronicles and the Ridley that was portrayed in this novel. Ridley was literally my idol, bad to the bone and unapologetic for it; she was willing to go above and beyond to get her own way and make sure that she came out on top. But that isn't what we got here. We got ... Lena in Ridley's body. I understand that it would be difficult for Ridley to have to try and blend in with Mortals when she has never done so previously but she was so whiny and self-depreciating that I wanted to tear my eyes out. The plot was fine. Nothing extremely special but nothing too out of the ordinary either. I actually quite liked the idea that Lennox could take people's powers as his own. I just don't understand Ridley's appeal to him. The love triangle thing made me literally gag. Because the Ridley Duchannes I know and love would have just used Lennox to get what she wanted and left him high and dry. Instead she almost, dare I say it, relied on him to help her with things. And that doesn't seem like Ridley to me. I don't have much more to say about this. It felt like a knock off of the other series in a bad way instead of being the bad assery that it could have been with Ridley taking the lead. Overall: 3/5 stars. It was appealing but it wasn't enough for me to really want to read the rest of the series. I am not a fan of the fact that there was a love triangle thrown in here. I would have much rather just read about how Ridley and Link are continuing on with their on-again-off-again relationship tbh.